Grace Brickley (1904-2004). Click on the images to expand them. 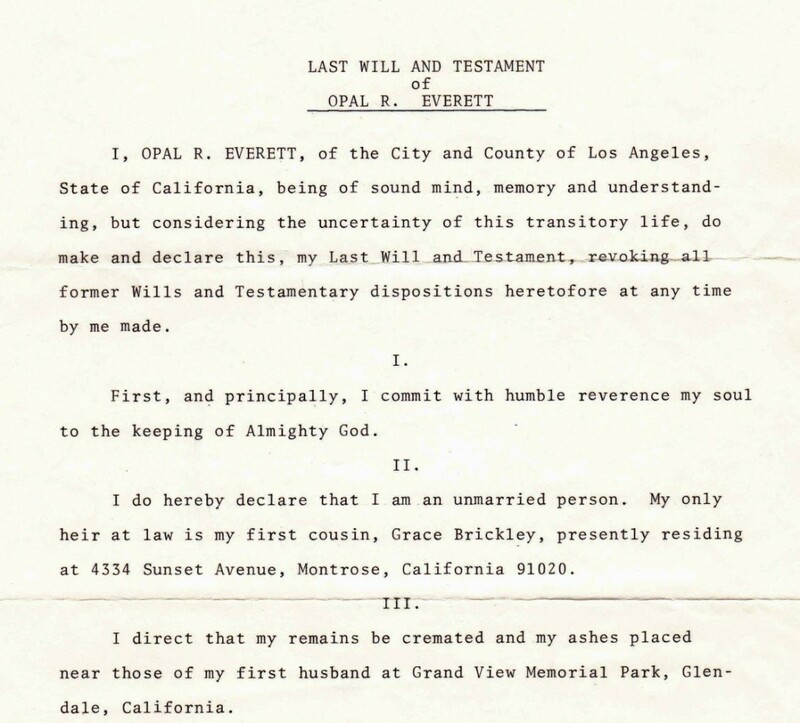 I had tracked Grace down through Opal’s will, which was by then eighteen years old. 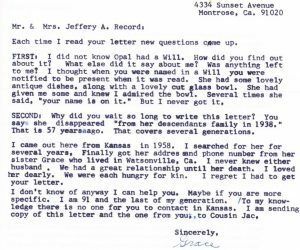 I was fortunate that Opal had stated her cousin’s name and address – and luckier still that Grace hadn’t moved in roughly 40 years. I’d also relied on information provided by the will’s executrix, Emma Lou Peake. Emma had been Opal’s best friend, and she was someone about whom Cousin Grace had no compunction in voicing her disdain. Miss Peake and Cousin Grace appear to have been somewhat bitter rivals for my great-grandmother Opal’s attention, affection, and even her meager possessions. Opening the door, a small woman greeted me cordially. Surely this bird-like creature couldn’t be related to my grandmother – my grandmother who had towered in stature (and voice!) over most men and women alike. However, as I crossed over Grace’s threshold their similarity rushed toward me. It was that same fearless air that always seemed to surround my grandmother. She ushered me into her sparsely-furnished home. There were no pictures on the walls or adornments, save for her picture of Christ, and what looked to be an antique porcelain canister sitting alone on a cold fireplace mantel. An old Siamese cat she called Mitzi stared at me blankly from a back room. I recall only one sensible stuffed armchair, a table-style pole lamp, and a very old Zenith television. On the table edge was a dog-eared copy of Opal’s letters – well marked. Grace began our conversation that day by doing what families do best – by taking care their own. She reiterated her protective stance of the Young family, past and present. She spoke cautiously to me of who within the Young family I might contact and who I must not. The secret of my grandmother’s illegitimate birth would not be advertised on her watch – though by then it had occurred more than 80 years before. 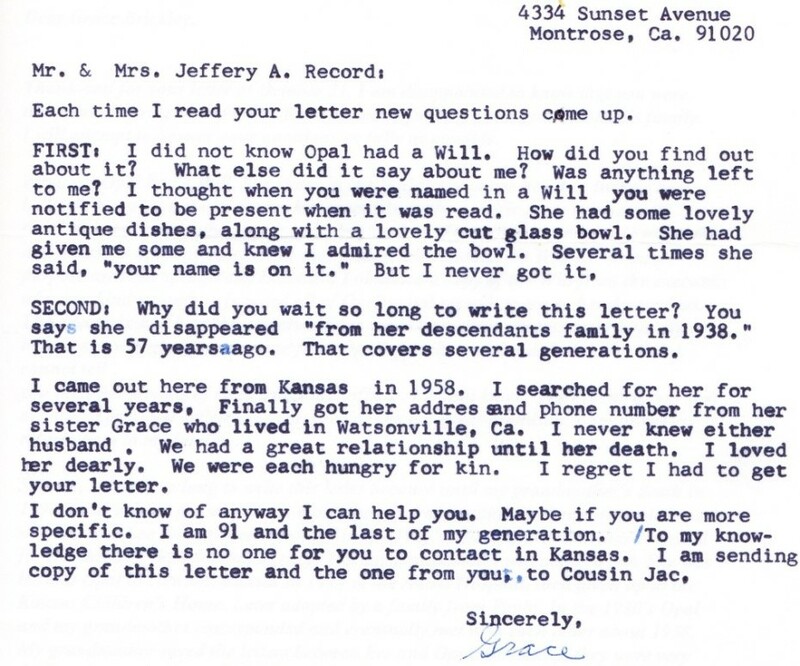 The same day, Grace returned the copies of Opal’s letters to me. She had harbored them for eight years. She said: “I don’t want them here when I am gone – someone may find them.” I realized that Grace was still protecting the family, still protecting Opal, and that my grandmother’s birth would always be, in Grace’s eyes, a secret. Opal Rae Young [Porter] [Everett] (1895–1978). 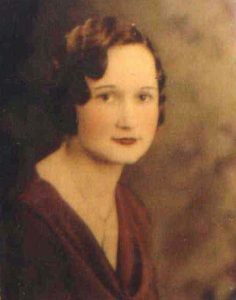 Grace Lucile Brickley (1904–2004), daughter of Carrie Rebecca Young, a paternal aunt to Opal Young. 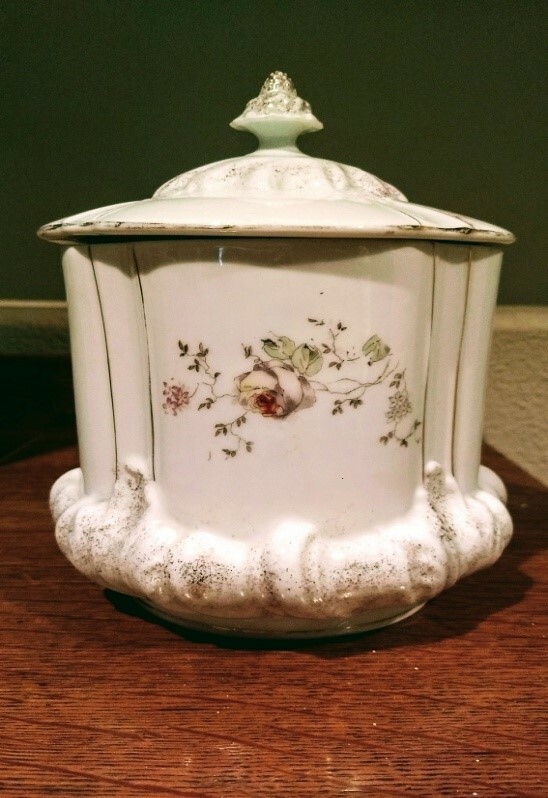 Grace had been (very briefly) married to A.W. “Fritz” Nicodemus – a surname she almost immediately renounced. 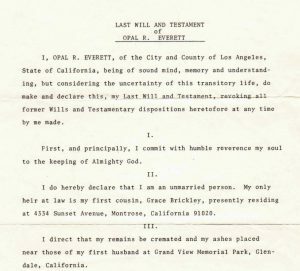 Last Will and Testament of Opal R. Everett, Los Angeles County, October 1977. Emma Lou Peake (1919–2007) was a next door neighbor to the widow Opal R. Everett in West Hollywood, California. Jeffery A. Record, Looking for Opal, privately published in October 1995. Beautifully written story. All families have these secrets, glad you could sensitively address yours. What a wonderful story with the message that no matter how independent — we all need family. You are so lucky to have had an eight year relationship with her — and she with you. I agree, Your writing is so well done and makes the story come alive. I am another cousin!! and am grateful for your interest in our line. 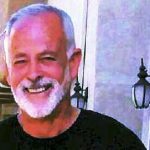 I found this story while stumbling through geology records. My husbands great aunt is this Emma Lou Peake. I absolutely adored her and we miss her very much. I would love to have any information you have on her. Family always has their own version of a person, but I wonder if she told you anything fabulous that she didn’t share with us! Thanks so much for sharing!